I finish my swim workouts with a few minutes of active breathholding exercises which I feel make me a better waterman and a better photographer. Photographers working in or under the water must often deal with chaotic, stressful or just plain physically demanding situations. I have found that being able to better control my heartrate and breathing in such situations really helps me to keep my focus and hopefully come away with a photograph I am proud of. I thought about this today during my swim (just a few minutes ago) and decided to jot this down while I had some clarity of thought, before all that highly oxygenated blood that is buzzing through my brain departs for my belly when I eat lunch. The Prelude: After a full swim workout, one’s heart is tick-tick-ticking away with optimal performance, and one’s body is piqued and in a elevated state. That is a perfect time to practice relaxation and breath control. My swim today is an example. I swam, pulled and kicked about 2800 yards, which took me about 45-50 minutes. My hunch is that my heart rate neared its peak after about 8 minutes or so, and that it stayed there through the rest of the swim. After about 12 minutes I really felt “in the zone”, and I stayed there the rest of the way. By the time I finished my heart and breathing were really going. Being able to have some control over them at that point is similar to being able to control them in a stressful situation in the ocean. The Exercise: Once I’m done with my workout, I hang motionless on the side of the pool and relax for about 2 minutes, staring at the tiles on the edge of the pool. I try to mentally eliminate any distrations and concentrate on lowering my breathing and heart rates. It sounds funny but I honestly feel that I can lower my heartrate just by thinking about it. After a couple minutes of relaxing this way, I will then swim a series of five to eight breathhold cycles (25 yards out, turn, 25 yards back). I will swim out, turn, and swim as far back as is comfortable underwater before rising for a first breath. I then swim the remainder of the cycle slowly on the surface, as relaxed as possible and breathing deeply and easily. I think about my heartrate the whole time, focusing on keeping it slow and easy, and on keeping my entire body relaxed and streamlined. I should stress that I try to remain comfortable doing this. I do not want to push the breath holding too far while swimming underwater, for fear of blacking out and drowning. I first came up with this technique about 14 years ago, in preparation for a photography assignment where I had keep up with world class swimmers and wild dolphins in open water. These expeditions were repeated about 6 times, plus Skip and I had a series of whale filming and photography shoots during those years as well, so once I started these breathholding exercises I just never stopped. I have kept them essentially unchanged since 1998. I carry out this exercise at the end of all of my swim workouts. While some days I feel and swim better than others, just about every time I practice it I find that on each successive breathhold cycle I can swim further underwater than the cycle before. The entire exercise takes about 8 minutes to complete. My heart rate feels lower each cycle, and my breathing definitely relaxes and slows during the course of the exercise. By the time I get out of the pool, I am very relaxed. 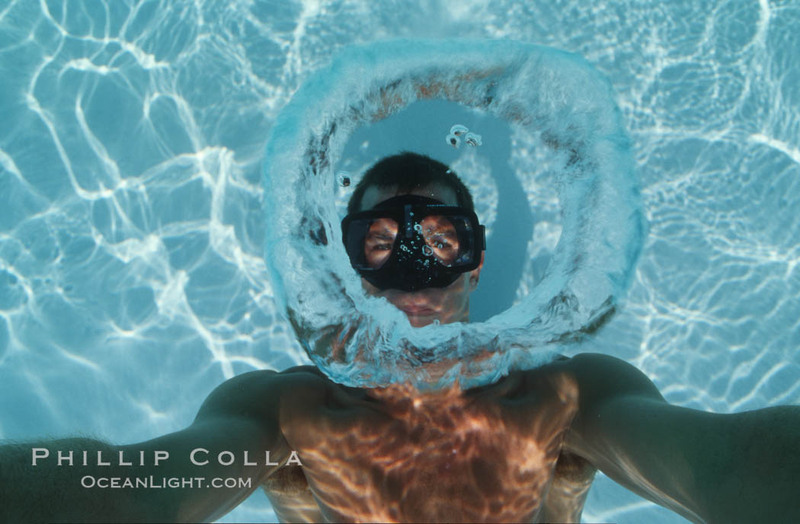 The Payoff: This exercise has a direct application when I am in the water shooting photos. Whether I am in large surf, strong currents, surrounded by a lot of animals, getting bumped or inspected by some big or gnarly animals, or am just in some generally stressful situation, as a result of my pool exercises I am better able to regain my focus, guide my body into a more relaxed state, lower my breathing and heartrate, function more efficiently and with fewer errors, and increase my margin of safely. All of these things also increase the odds that I will emerge from the situation with a good photograph. Plus it helps you blow good bubble rings underwater.